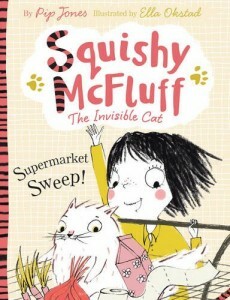 I’m very excited because this month sees the release of my second book, Squishy McFluff: Supermarket Sweep! 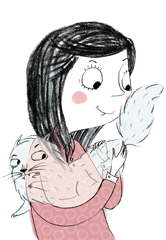 As the title suggests, Ava and Squishy are off to the supermarket – and although Mum thought Ava’s invisible kitten was going to start behaving himself at the end of the first book, you’ll see that Squishy McFluff just can’t help but have lots of brilliant ideas for fun…! Oh yes, things are about to get very messy. I really enjoyed writing Supermarket Sweep! and I expect many parents who read it might relate to the, erm, challenges of shopping with a small child or children. 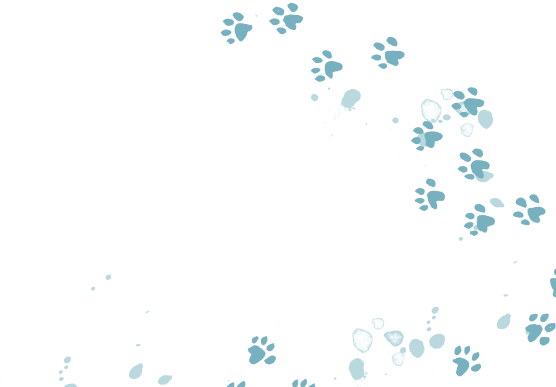 Rather like the first book, the idea for this one stemmed from a real event – specifically, an event involving a can of rice pudding. You see, I’d gone shopping with my daughters, Ava and Ruby, and they were both EVER so keen to ‘help’ me do the shopping. I lost count of all the items which were chucked in the trolley and I surreptitiously put back when they weren’t looking. But when we got home, and I unpacked the food, there it was. A can of rice pudding which I had inadvertently paid for and put into a bag without noticing. I still have that can of rice pudding. I’m not sure why, because it will NEVER be eaten in this house. No-one here likes rice pudding. Does anyone like rice pudding?! Would anyone like a can? I expect it’s still within its sell-by date (just!). 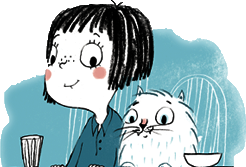 Very soon, Squishy McFluff and I will be heading to the Edinburgh International Book Festival, where I’ll be reading the new book (as long as some children help me to convince Squishy to behave himself, of course). So I’ll look forward to seeing some of you there. In the meantime, I very much hope you enjoy the new book, and do let me know what you think in the comments.